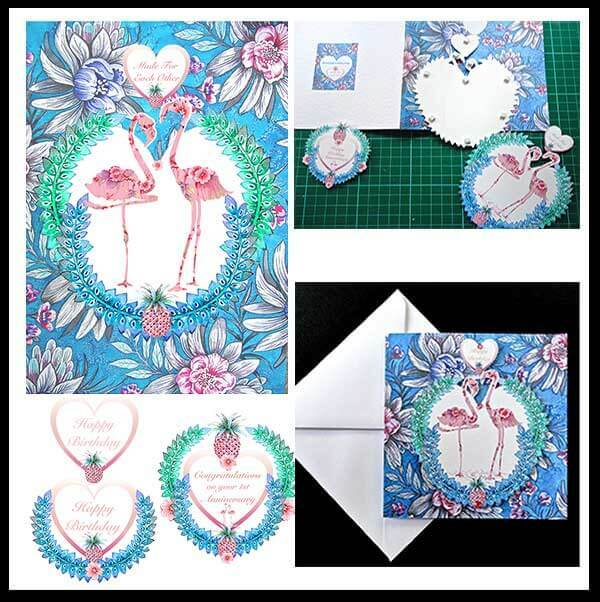 At last after last month’s blog on the subject of Flamingos and Pineapples, being one of 2015’s most popular trends, I have now designed a couple of cards that I thought you would like to see – these are now on sale online. 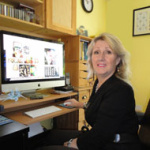 I do like new products to link in some way to my existing collections of products and designs. Having another tropical bird set in its own ‘Pink Paradise’ is the inspiration for my new cards. 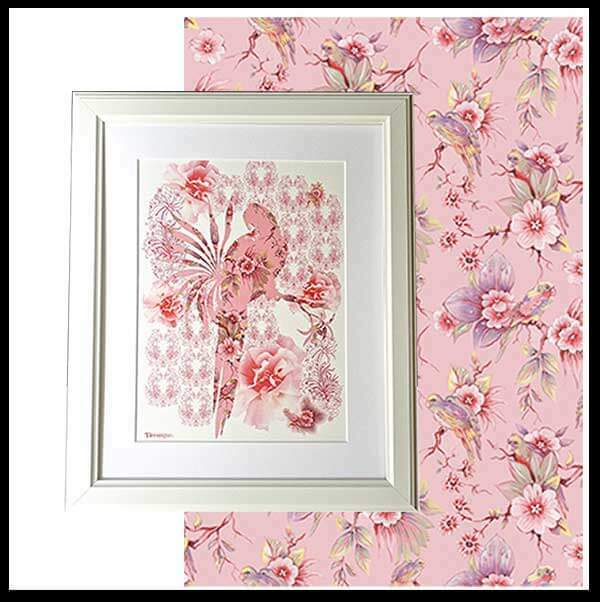 This A3 art print, with the decorative parrot has exactly the look I need for my lovely flamingos. My first card is the Pink Fantasy Flamingo Card. 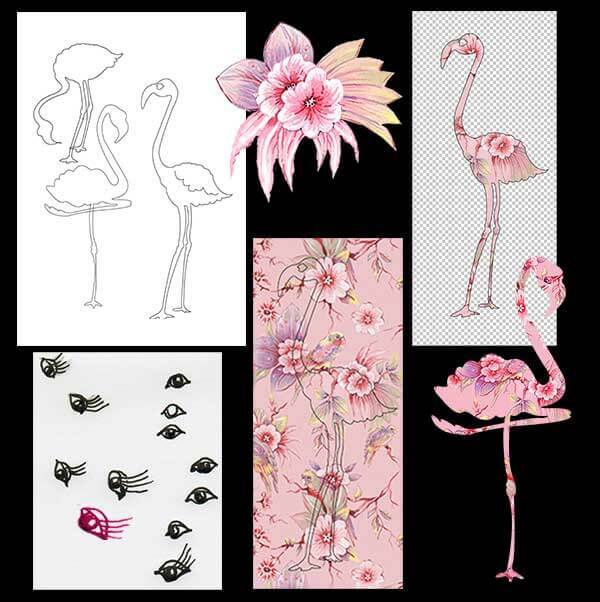 Using the same soft pink tropical floral chintz pattern, one of my own designs, I cut out in Photoshop my previously drawn flamingos. To display that coy magic between male and female, I have chosen two slightly different poses. The female is more at ease, standing on one leg, maybe dozing, with her long eyelashes and one eye open, knowing the male stands tall, attentively close. This chemistry is intentional to symbolize the text ‘Made for Each Other’. In order to actually place these two birds in a relevant setting, I have used fan-shaped leaves drawn in Illustrator, coloured in gradient tones of olive and pink. As in all my designs, I like to have depth and love overlapping with degrees of opacity, which I have done here, centred with a cluster of flowers and leaves. For the ground I have used a strip of skin print in pink, which introduces a little texture to the composition. 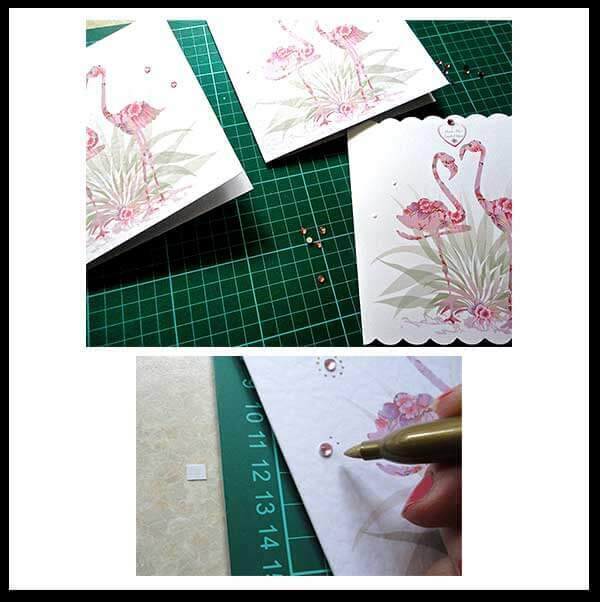 After the cards are printed on blank white cards 150 x 150mm in my own studio, I like to hand finish with some spaced pale pink glass gems; around which are halos of gold dots drawn freely by hand using a metallic pen. Inside is more text contained in a larger decorative heart, hand-cut and mounted with a glass gem. This card saying ‘Made For Each Other’ is so perfect for a couple on their special day, whether it be a Wedding Day, Engagement, Anniversary or even Valentine’s Day. Different options are always available, where the text inside can be changed to convey your exact message. 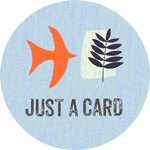 In my webshop at the moment you can buy this design as simply a Birthday Card to send to your perfect partner, a Thank You Card, Anniversary or Bride & Groom for their wedding day; on request, more specific personalization is possible. 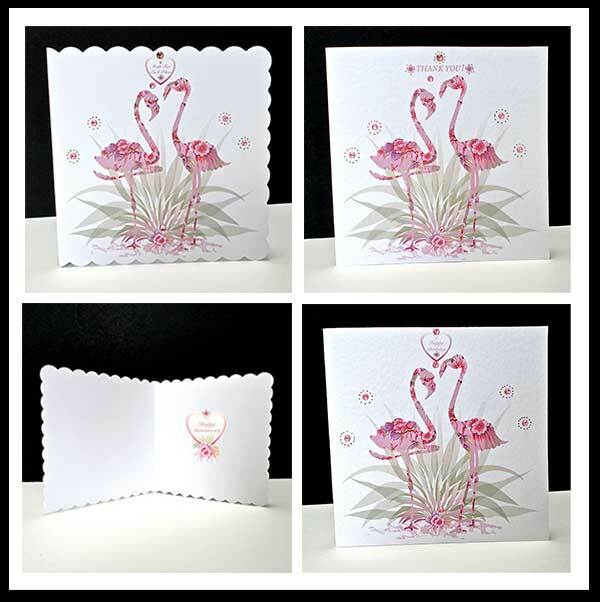 The above images show the finished ‘Pink Fantasy Flamingo’ cards ready to join the collection. But my love of the Flamingo does not finish here! Taking these pink chintz flamingos further I created a new version for my daughter and son-in-laws’ 1st Anniversary. This card is much larger than usual as it needs to be unique and an impressive size for such a special day! 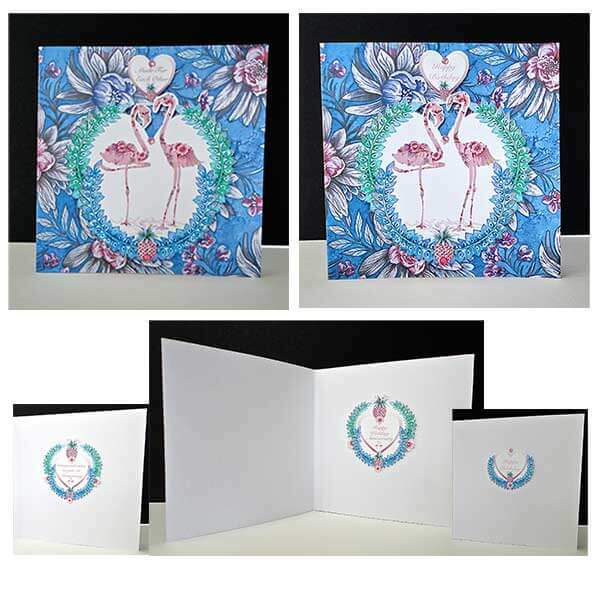 The ‘Antique Floral Flamingo Card’ has a hand-painted, water-colour floral and leaf design on a mottled blue ground, printed directly on to the card. 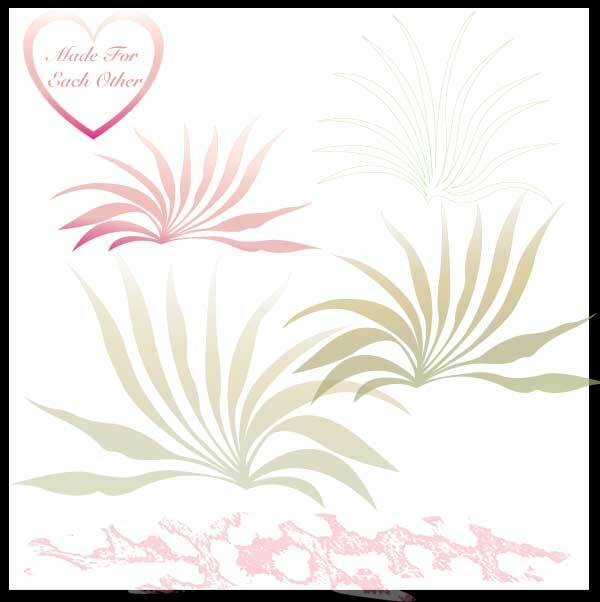 Printed separately on Epsom Matt paper are two hearts, the larger one having the two flamingos, set on a white, edged with blue and green ferns and a central pineapple at the base; and a second, smaller heart with the text “Made For Each Other’. 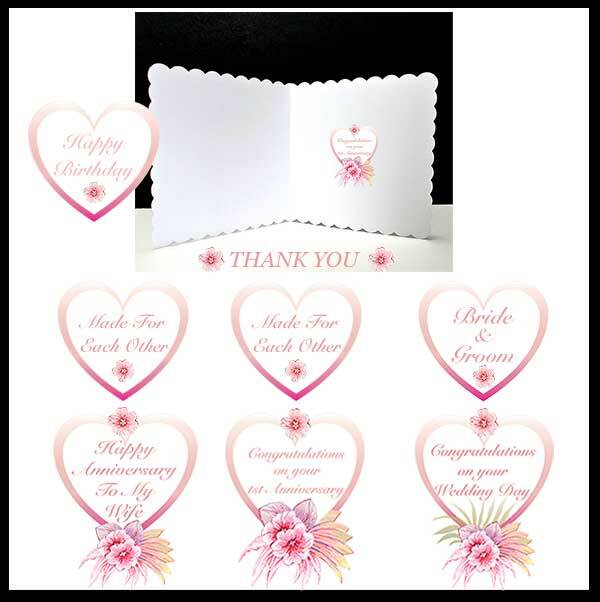 These are hand-cut and mounted on the card with double-sided foam pads and pink glass gems added just to add a sparkle to this exotic scene. This card is also suitable for many occasions, a few of which are shown below; this smaller version 150 x 150mm is now for sale on-line.